What kind of Fire Belly is it? Probably the most common question people ask about their fire belly newt is "what kind is it?" They hear word of things called Dwarf Fire Bellies, Chinese Fire Bellies, Japanese Fire Bellies, etc. Perhaps they question the label the pet store gave it. Perhaps it confuses them whether they have one species or two. Perhaps I can shed some light on the subject. But probably the best way to distinguish this species from the Japanese fire belly is the shape of the tail. The end of the tail of a Chinese Fire Belly Newt is rounded. 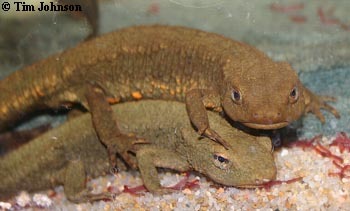 This newt used to be far more common a few years back, but is only rarely found in pet shops. Don't mistake your newt for one just because your pet shops says it's one. Japanese fire bellies have more granular, or rougher skin, than the Chinese Fire Belly. We're not talking a slight difference in texture, but a big difference. They are also a bit larger as adults, from 9-13 cm (3½-5 in). The end of their tail is sharply pointed, not rounded like the Chinese species. Typically the belly pattern appears to be more speckled rather than blotched, but a few races of C. pyrrhogaster do have blotches. They usually have more prominent parotoid glands (bumps at the back of the head on each side). In determining if it's this species, take into account all differences. Don't just assume that because it has rougher skin that it's a Japanese. Same with the belly pattern. If it has rough skin, speckled belly, and a pointed tail, then it's more than likely the Japanese species. 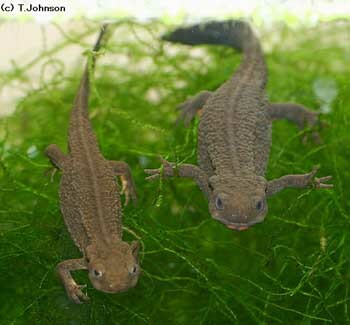 Often, these newts are mistakenly labeled as firebellies or giant firebellies. They can be easily distinguished by having a tail shaped like a boat paddle (gets bigger toward the end). Paddletails have extremely smooth, almost slimy feeling skin. Adults are rather large, and can get bigger than 13 cm (5 in). 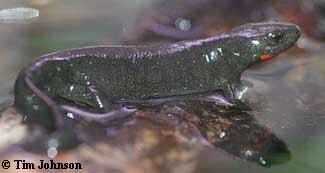 Paddletail newts have smooth skin and a broad paddle-like tail. Sometimes these are sold as a "firebelly". 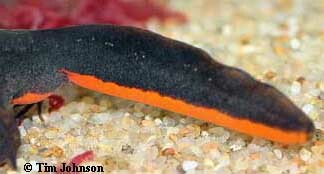 Usually if they are labeled as firebellies, they are labeled as a Giant or Large Fire Belly Newt. Most have bumpy, warty skin. And they can be easily identified by having a black belly with red or orange spots, instead of a red belly with black spots as in the above species. Typically, they are brown, but a few species are moss green. Warty newts are generally larger than the Chinese or Japanese firebellies, with typical sizes around 12-15 cm (5-6 inches). Warty newts look very different from other kinds of "firebellies". Shown is Paramesotriton fuzhongensis.